The Washington DC Chapter of ACM SIGGRAPH is proud to present, Virtual Reality (VR) in Architectural Visualization with Daniel Zeballos, Production Manager at the award winning Illustrate My Design (IMD). Daniel will be discussing and demonstrating how the studio is using VR for Architectural Visualization. In addition, Daniel will discuss games developed by the studio including a marketing game designed for the ADDY’s (American Advertising Awards). IMD, which was established in 2008, has completed numerous local and international projects including visualization for national landmarks. In 2018, IMD received the DC Webfest “Local Hero Award” in the VR/AR Category for “The Story Unfolds”. IMD also received the 2018 American Society of Architectural Illustrators Award of Excellence Rendering Section. Please join us on Thursday, May 17, 2018 from 7pm to 9pm at the Illustrate My Design studio as we explore how VR is used in Architectural Visualization. Paid street parking is available in most areas of Old Town Alexandria. There is limited free parking in nearby residential areas, but it is restricted to two hours. There are also garages within walking distance. For real-time maps to locate parking in garages, visit the ParkMe website or download their free iPhone app. Parking regulations are strictly enforced by the City of Alexandria. Parking is free after 9 pm, on Sundays, and on state holidays. Persons with proper handicapped identification on their cars may park free at any meter and are exempt from residential parking sticker requirements. Metro riders will use the Yellow or Blue lines then exit at the King Street Metro. The free trolley runs between the Metro station and the waterfront. We would like to request an RSVP to our Facebook page (https://www.facebook.com/DCsiggraph), or email us at DC-GRAPH-Officers@listserv.acm.org, then indicate if you will be bringing a demo reel to share. You can also put your demo on a website then we will test the link before the event to make sure everything works. Please join us on Thursday, April 19, 2018 from 7pm to 9pm at the US Patent and Trademark Office as the Washington DC ACM SIGGRAPH chapter discusses demo reels, portfolio questions, and more at our Annual Demo Reel & Portfolio Night. The Washington DC Chapter of ACM SIGGRAPH is proud to present, Geospatial Mapping with Craig Brower and Isaac Zaworski of VRICON. Isaac and Craig will conduct an interactive discussion on all things geospatial to include, how geospatial mapping technology, along with satellite imagery, has changed the face of traditional mapping techniques as well as how the technology has become part of our everyday lives. From cell phones to satellites, we will explore how geospatial mapping has changed the way we view our world. Please join us on Thursday, March 15, 2018 from 7pm to 9pm at the Torpedo Factory Art Center as we explore the exciting world of geospatial mapping with Craig Brower and Isaac Zaworski. Craig joined Vricon early in 2015, making him one of the company’s first employees. No stranger to the intelligence and defense communities, he started his career at the CIA and has held leadership positions at BAE Systems, DigitalGlobe, and Leidos. Craig also is a professional photographer whose portfolio includes official snaps of President Clinton’s inaugural ball. Isaac is an engineer at heart and comes to Vricon via Urban Robotics, where he was the CTO. Isaac’s passion focuses on overcoming the challenges presented by 3D imagery data sets, and he’s done this in military theaters around the world. Isaac grew up in the Pacific Northwest and views it as one of the best places to live – we think this view is influenced by easy access to Voodoo donuts. The Washington DC Chapter of ACM SIGGRAPH is presenting an encore showing of the Computer Animation Festival Showcase. If you missed the show at the Torpedo Factory Art Center, this is your chance to catch it again. The Computer Animation Festival showcases some of the most dazzling and innovative animations from 2016-2017, many of which were presented at the SIGGRAPH Computer Animation Festival. We will also discuss our upcoming events for 2018. For those who are not familiar, the SIGGRAPH Computer Animation Festival is recognized by the Academy of Motion Picture Arts and Sciences as a qualifying festival for the Academy Awards. Since 1999, several works originally presented in the Computer Animation Festival have been nominated for or have received a “Best Animated Short” Academy Award. Please join us on Thursday, January 25, 2018 from 7pm to 9pm at the US Patent and Trademark Office as we showcase some of the best examples of computer animation from around the globe. The Washington DC chapter of ACM SIGGRAPH is proud to present Exploring WebVR with Sean McBeth, developer of the Primrose VR framework. Sean will provide a brief history of VR on the Web followed by a survey of the available platforms and frameworks. He will also discuss how these pieces all fit together. The discussion will be followed by a short demonstration on using Primrose to get started in WebVR. The Washington DC chapter of ACM SIGGRAPH will also conduct our annual election for chapter board positions at the beginning of the meeting. All eligible voting members of the Washington DC ACM SIGGRAPH chapter were notified to nominate board members by November 3, 2017. The results of the nominations are posted below. Please join us on Thursday, November 16, 2017 from 7pm to 9pm at the US Patent and Trademark Office to learn more about WebVR with Sean McBeth. Sean McBeth is a senior consultant at Deloitte Digital for virtual reality, augmented reality, games, simulation, graphics, abstract data visualization, audio synthesis and processing, computer vision, peer-to-peer networking, desktop, Web, mobile, real-time communication, hardware prototyping, embedded systems, reporting, GIS, and relational database systems. 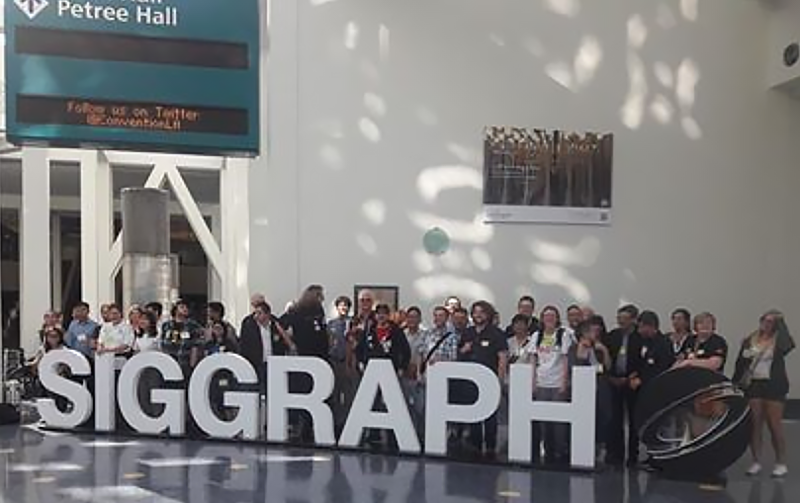 Please join us on Thursday, August 31, 2017 from 7pm to 9pm at the US Patent and Trademark Office to learn more about the latest news from the SIGGRAPH conference.